Essay Daily: Talk About the Essay: Meet Montaigne! On a pleasant afternoon outside Bordeaux, in his tower at the corner of his family chateau, the writer and statesman Michel de Montaigne, stocky and bedraggled in britches and poofy blouse, was serving us wine from the estate’s northerly vineyards. 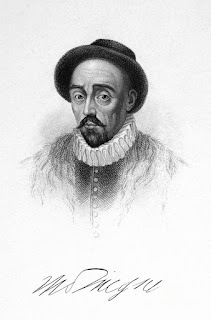 His first two volumes of Essays, which appeared in 1580, contained this prefatory warning: “Reader, I am myself the matter of my book; you would be unreasonable to spend your leisure on so frivolous and vain a subject.” Yet readers did spend their leisure on reading the Essays, enjoying Montaigne’s candor; his wavering even-handedness; his playful, associative mind on display in the text. And not only in France in the sixteenth century, but around the world and through the centuries. This simple man of letters seems as surprised as anyone that his literary legacy has lasted over four hundred years. “I do not love myself so indiscriminately, nor am I so attached and wedded to myself, that I cannot distinguish and consider myself apart, as I do a neighbor or a tree,” he commented as he poured refills then tenderly passed us an original printing of his book. “Here you have some excrements of an aged mind,” he chuckled, “now hard, now loose, and always undigested.” And we all had a hearty laugh together. Born Feb. 28, 1533, in Guyenne, France. Married to Françoise de la Chassaigne (1565-92), with six children, one who survived infancy. Out of respect for her honor, I have never gazed upon the breasts of Mme. De Montaigne. I will not sit with thirteen at the table. I can dine without a tablecloth, but very uncomfortably without a clean napkin. My teeth…have always been exceedingly good… Since boyhood I learned to rub them on my napkin, both on waking up and before and after meals. I am not excessively fond of either salads or fruits, except melons. I was expecting more, or perhaps less, from Stoic. Perhaps the prison film is not my genre. The Cannibals was interesting in a lurid way, surprising in its Sophoclean inspiration. I frankly thought there would be more about the cannibals. Perhaps I’m too literal about these things. A Man For All Seasons was one I watched several times. It reminded me that as an ill conscience fills us with fear, so a good one gives us greater confidence and assurance. When I dance, I dance, when I sleep, I sleep, and I think Fred Astaire is like a sleep dancer, walking on air . . . that magical man. He seems to stop time. So, I’d say Swing Time is a good one, with Ginger Rogers . . . I am very much driven by beauty. So let’s just say anything with Rita Hayworth. The felicity that glitters in virtue, shines throughout all her avenues and ways. Oh, and “Put the Blame on Mame”! I study myself more than any other subject. Understood, but any books grabbing you lately? What do you think of more contemporary essayists, say, James Baldwin? If you press me to say why I loved him, I can say no more than because he was he, and I was I. I also quite like that fellow Sebald. We understand that your tastes in music run from des Prez and Willaert to more contemporary fare. Can you share with us some of your favorite popular songs? “Boys, Boys, Boys,” by Lady Gaga would seem to capture the essence of the Socratic impulse. 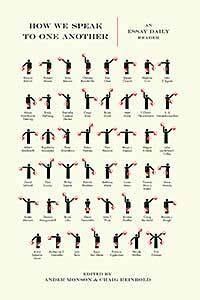 Then there’s “I Just Don’t Know What to Do With Myself,” by the White Stripes. Lisa Hannigan’s “I Don’t Know” is quite good. Dusty Springfield sang a song very true to my way of thinking, “How Can I Be Sure.” Then, of course, Ray Charles singing “You Don’t Know Me” speaks to me of the wavering and noncommital natures we carry in this shifting world. Similarly, the Clash’s “Should I Stay or Should I Go” comes from a dilemma I have often found myself contemplating. So this new book, After Montaigne . . . what do you think of the use of your work as the basis for new musings? I seek in books only to give myself pleasure by honest amusement. I seek only the learning that treats of the knowledge of myself. [After Montaigne] has this notable advantage for my humor, that the knowledge I seek is there treated in detached pieces that do not demand the obligation of long labor, of which I am incapable. I find it admirable at representing to the life the movements of the soul and the state of our characters. I cannot read it so often as not to find in it some new beauty and grace. Amongst so many borrowed things, I am glad if I can steal one, disguising and altering it for some new service. All the glory that I aspire to in my life is to have lived it tranquilly. There is nothing that poisons a man so much as flattery. David Lazar and Patrick Madden are co-editors of After Montaigne: Contemporary Essayists Cover the Essays (Georgia, 2015), which includes over two dozen wonderful essayists writing "cover versions" of the master's works. They have each visited Montaigne's Tower in France, and were each turned away because it was then closed. David made it back the next day. Patrick will have to make another pilgrimage. Don't try to visit on Mondays or Tuesdays, friends!